As always there are a lot of exciting free things to do in London this weekend. However we’ve managed to pick the top 5 including also some Friday events. We are excited about the EP Launch gig of Jungle Doctors at the 93 Feet East and the screening of Little Eangland at the Hellenic centre. There is also the Christmas Lights event on Regent Street as well as the 36th Open Studios Art Show at the Wimbledon Art Studios. 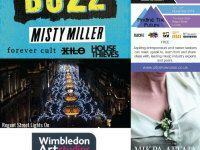 So without further ado here is our Top 5 Free Events in London this weekend 14-16 November 2014! You can find more free London attractions or free sport activities. You may also want to have a look at the Top 10 Free Events in London in November.